Cornish clotted cream fudge that tastes like fudge from a sweet shop. This fudge has a divine caramelised flavour and an irresistibly creamy texture. 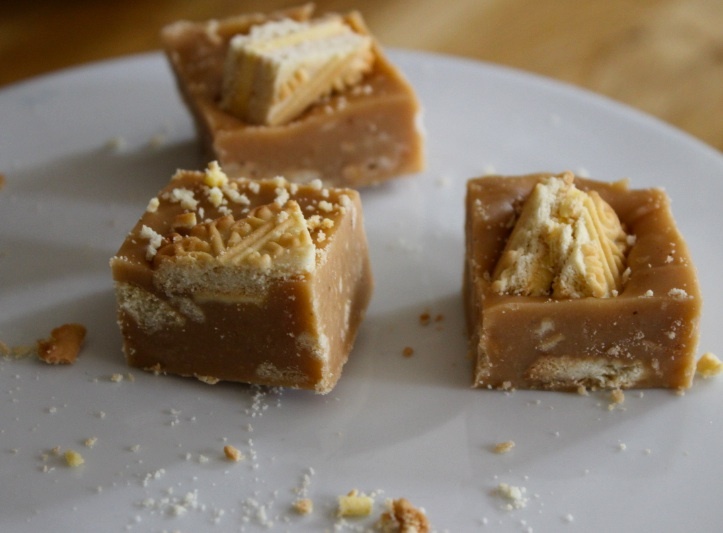 I wanted to share this fudge recipe in time for the start of the festive season. I make fudge mostly over Christmastime and this clotted cream fudge is a recipe I’m repeatedly asked to make every Christmas. It’s a delicious and thoughtful gift for family and friends – who wouldn’t love to receive an edible gift as a Christmas present? This fudge recipe I’m sharing with you today is inspired by my love of Cornish fudge. Cornwall is an idyllic area in the South West of the UK, if you’ve ever visited Cornwall then you’ll know just how amazing the scenery is and how equally special the food is too. If you have sweet tooth then you’ll enjoy all that Cornwall has to offer in terms of cream teas, ice cream and endless fudge flavours to choose from! It’s been far too long since I last shared a fudge recipe and I knew I had to do something about that. I made this chocolate fudge a while back and since then I’ve had suggestions to share a vanilla version. You won’t need to use a sugar thermometer to make this fudge, just stir all the ingredients together in a saucepan, bring it up to the boil, then continue to boil the mixture for another 3-5 minutes. Stir it every now and then to make sure the mixture doesn’t burn on the bottom of the pan and pick up too much colour. Once the fudge has turned a light golden colour, this is now your cue to remove the pan from the heat. After the pan is off the heat, you’ll now need to beat the fudge mixture until it becomes matte and is thick (this can take anything from 5-10 minutes to achieve the correct consistency). I’m not going to lie as this last step does need a fair bit of elbow grease, but it will be worth all the hard work, trust me on that! I made this fudge again last week ready for Christmas gifts, I like to get organised with my Christmas preparation as I’m usually working up to and during the festive season. This fudge will last in an airtight container in the fridge for up to 2 weeks and it can also be frozen for up to 3 months, I have now got a batch of fudge in the freezer, well maybe half a batch! Line a 8 x 8 inch (20 x 20cm) square tin with parchment paper and set aside. Place all the ingredients in a large saucepan. Heat gently and stir until all the sugar has dissolved. Turn the heat up and the bring the mixture up to the boil – occasionally stir the fudge to stop it catching. Allow to boil for 3-5 minutes until it’s turned a light golden colour. Then take straight off the heat – you can check the fudge is ready by using a sugar thermometer. If it has reached 116°C / 240°F then it’s ready. But if you don’t have a thermometer you can drop a small amount of the mixture into a glass of cold water and if a soft ball forms, then the fudge is ready to take off the heat. Using a wooden spoon, continuously beat the fudge for 5-10 minutes until it is really thick and matte. Spread the fudge into the tin you prepared and lined earlier and then leave it for 30 minutes at room temperature. Place the fudge in the fridge for at least 4 hours or overnight until set. Once set, cut the fudge into pieces – this recipe makes approx. 40 pieces of fudge. The fudge will keep in an airtight container in the fridge for 2 weeks or you can freeze it for up to 3 months if you want to prepare this fudge ahead of time. Be careful as the fudge mixture can bubble quite ferociously and easily cause a painful burn if it comes in contact with skin. I package my fudge pieces in clear gift bags which you can get from many online retailers and then tie a festive ribbon around the top or you could also use a small gift box lined with tissue paper to present your fudge. Dreamy clotted cream fudge speckled with crushed Biscoff. This recipe requires just 5 ingredients and couldn’t be any easier to make – customise with your favourite biscuits or confectionery. Homemade fudge would make a delicious edible gift for your family and friends for Christmas or any other celebration! 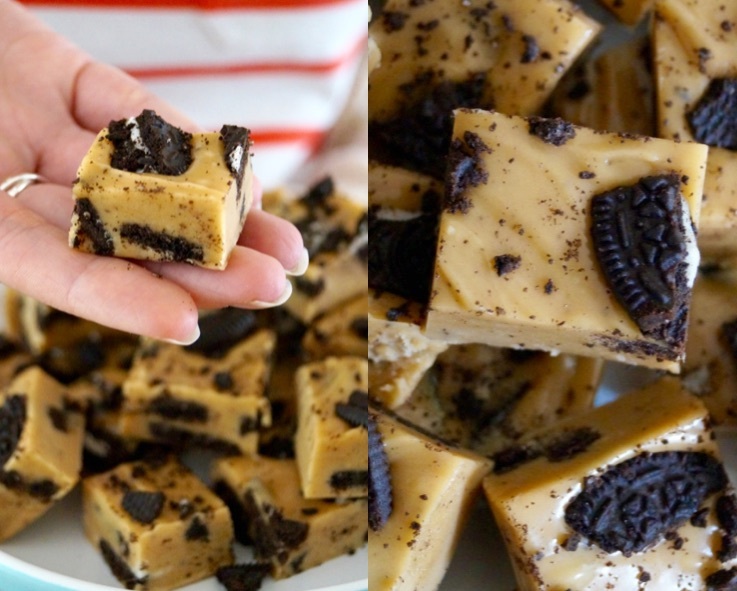 I love making fudge at Christmas and I really enjoy sharing my fudge recipes on the blog – this Custard Cream Fudge and this Oreo Fudge are just a couple of my favourites I have made so far. This time I’ve swapped the custard creams and Oreos for something a little more festive, and that is spiced biscuits – also known as Biscoff or Speculoos. On my last fudge recipe one of my readers and fellow food blogger Paola suggested I tried making clotted cream fudge with Speculoos biscuits. Ever since then I’ve been planning to create a spiced biscuit fudge to post on the blog, and I guessed Christmas would be the perfect time to share it. I’m not even kidding when I tell you how easy this fudge is to prepare. Simply place all the ingredients (apart from the crushed biscuits) in a large saucepan and stir to combine. Now heat gently and bring up to a rapid boil – at this point you need to be extremely careful not the burn yourself as the mixture bubbles. So if children are making this it is advisable to have an adult on hand to help out. After beating well, the fudge will thicken in texture, at this point you will fold in approx. 2/3 of the crushed biscuits into the fudge. I leave some remaining biscuit crumbs to decorate the top as a last finishing touch. This fudge is very rich, so I find this recipe makes just the right amount to satisfy my sweet tooth! And the negative? There’s only one. It’s way too addictive. I guarantee you once you’ve had one square you won’t be able to stop munching on this incredible fudge! A quick note: I get a lot of questions from readers asking me what clotted cream is, and what they could use instead of it. Clotted cream (also known as Devon cream) is a thick cream made by indirectly heating milk using steam or a water bath. Once cooked it is left to cool completely. During cooling time the cream content rises to the surface and forms clots. If you can’t find clotted cream where you live, the nearest substitute is double/heavy cream, but you can also make your own clotted cream using this great recipe. Sweet, crunchy and the perfect little treat! My Biscoff Clotted Cream Fudge is a must try recipe for anyone addicted to Biscoff and fudge! Place the clotted cream, sugar, golden syrup and vanilla in a large saucepan. Heat gently and stir until all the sugar has dissolved. Turn the heat up, and the bring the mixture up to the boil – occasionally stir the fudge to stop it catching. Allow to boil for 3-5 minutes until it’s turned a light golden colour. Then take straight off the heat – you can check the fudge is ready by using a candy thermometer. If it has reached 116°C / 240°F then it’s ready. But if you don’t have a thermometer you can drop a small amount of the mixture into a glass of cold water and if a soft ball forms, then the fudge is ready to take off the heat. Using a wooden spoon, continuously beat the fudge for 5-10 minutes until it is really thick and matte. Finally fold half the crushed Biscoff/Speculoos biscuits through the fudge. Spread out into the lined tin, and then decorate the top with the fudge with the remaining biscuits – make sure you press them in slightly. Place in the refrigerator for at least 4 hours or overnight. Once set cut the fudge into cubes. Check the fudge has reached the correct temperature by using a candy thermometer – it should reach 116°C / 240°F when ready. If you don’t own a thermometer, drop a small amount of the boiled fudge mixture into a glass of cold water. If a soft balls forms, then the fudge is ready to take off of the heat. Choosing the correct sized tin is important. I find an 8 x 8 inch tin is ideal for this fudge recipe. If your tin is too small, the fudge will not be as thick as it should be and won’t set well. Leave the fudge to set for at least 4 hours, preferably overnight for best results. If you’re not a fan of Biscoff, you can easily leave them out of the recipe, or even swap for another of your favourite biscuits/cookies or confectionery. I love the chunks of biscuit in this fudge! 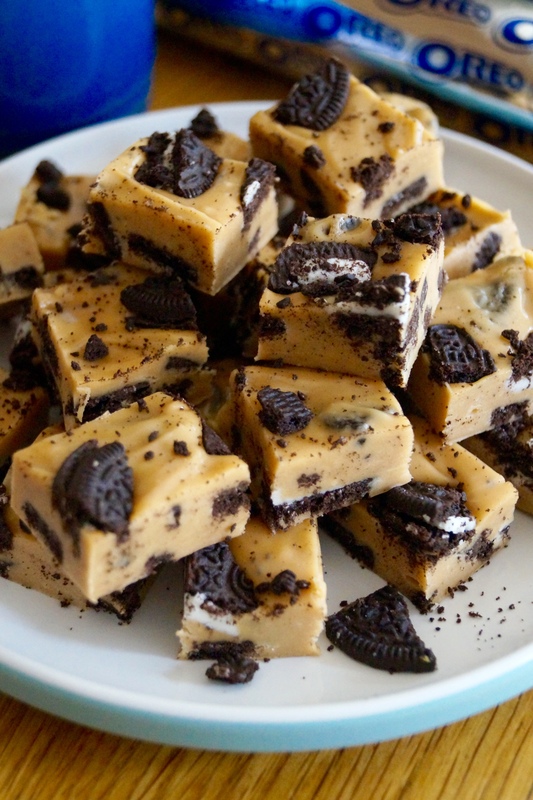 Classic clotted cream fudge studded with crunchy chocolate Oreo cookies. Just 5 ingredients and incredibly simple + easy to make! 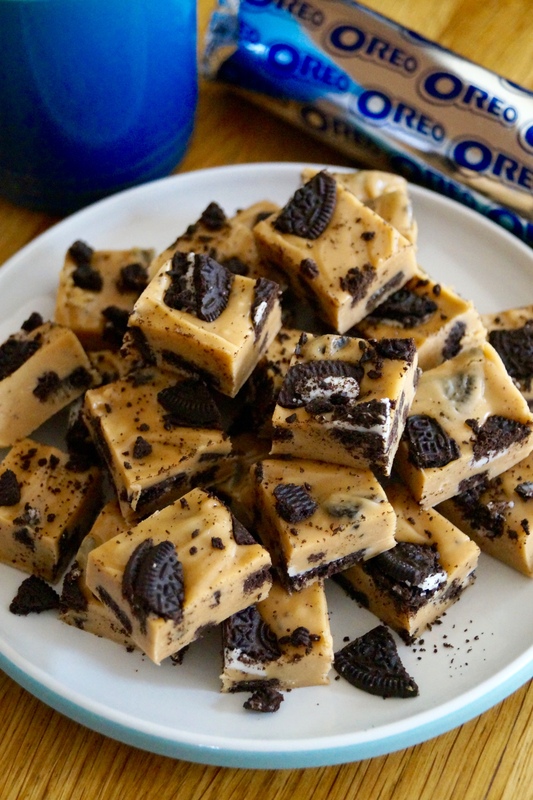 You are going to love this cookies and cream fudge! I don’t think I’ve ever met anyone who doesn’t love fudge. I mean what’s not to like about creamy smooth sweet bites of pure deliciousness? What I really like most about fudge, besides the fact it is delicious and seriously addictive, is how versatile each fudge recipe can be. 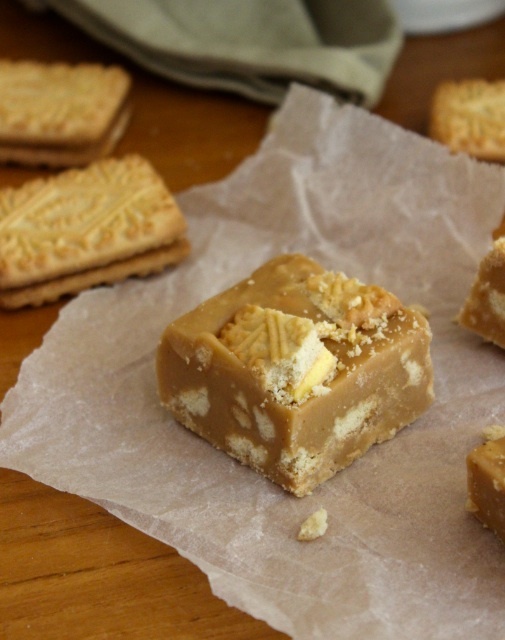 I’ve already shared my Custard Cream Fudge (the best creation!). That recipe always goes down a treat with my blog readers, and when I made it for a charity bake everybody went CRAZY for it, and it sold out in less than 2 minutes! After I realised the popularity of that fudge recipe, I decided to make a new version. 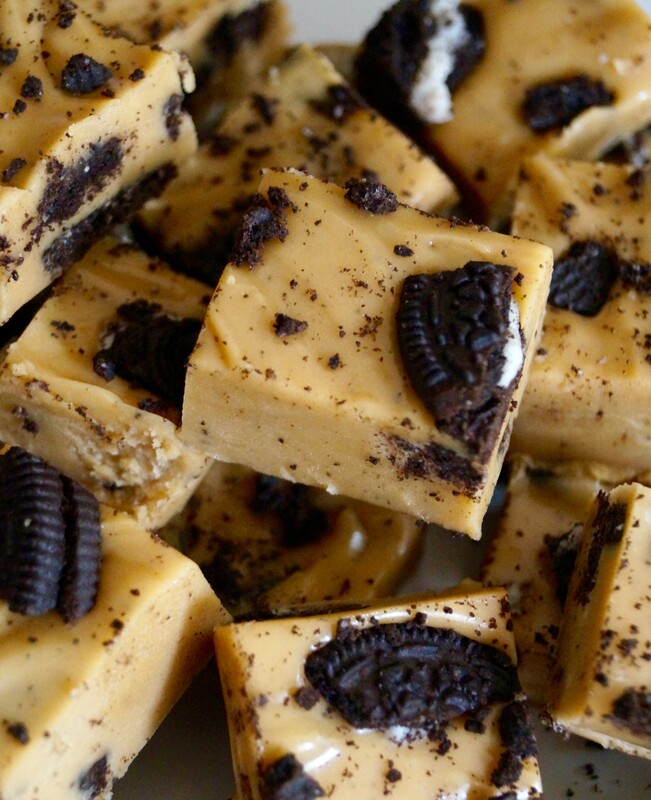 I made this Oreo fudge to take over to my best friend’s house last weekend and yet again, like the previous times I’ve made it, this fudge went down a storm with everyone who tried a piece! One of the best homemade treats and beautifully modelled by my sis! This fudge requires just a handful of ingredients. It’s inspired by Cornish clotted cream fudge which always reminds me of family holidays in beautiful Cornwall. But I’ve added a twist, the fudge is speckled with crushed Oreos which are one of my favourite cookies! The greatest thing about this simple recipe is that it’ll only take 30 minutes from start to finish to make and it doesn’t even require a candy thermometer! Making fudge can be an intimidating process, heating the fudge to the correct temperature, making sure it reaches “soft ball” stage. What is best about my recipe, is all you need to do with boil all the ingredients (minus the Oreos) for just 3 minutes then take straight off the heat and continuously beat the fudge until it turns nice and thick – that and waiting for the fudge to set are the two hardest parts of the recipe! Then finally finish by folding through the cookies. Leave it to set and then slice up! The fudge would make fab gifts wrapped up or put into decorative jars. It is the best kind of sweet chocolate treat, perfect for any occasion! Enjoy! Line an 8″ x 8″ square tin with parchment paper and set aside. Place the clotted cream, sugar, golden syrup and vanilla in a medium saucepan. Heat gently and stir until all the sugar has dissolved. Turn the heat up, and the bring the mixture up to the boil. Allow to boil for 3 minutes. Then take straight off the heat. Using a wooden spoon, continuously beat the fudge for 10 minutes until it is really thick and matte. Finally fold half the crushed Oreos through the fudge. Spread out into the lined tin, and then decorate the top with the fudge with the remaining Oreos – make sure you press them in slightly. Place in the refrigerator for at least 4 hours or overnight. Once set, cut into cubes. Fudge is best served chilled. It will keep in an airtight container in the refrigerator or at room temperature for up to 2 weeks. Other treats you make like to try! 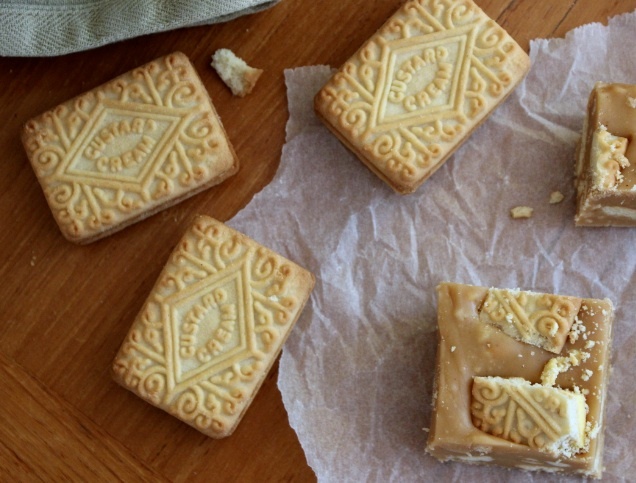 Custard creams used to be and are still my favourite biscuit. I thought it would fun and a bit unique to combine the crumbled biscuit into my favourite Cornish clotted cream fudge recipe. In each bite you get the smooth, luscious fudge and then there are nuggets of creamy, custardy biscuits throughout. 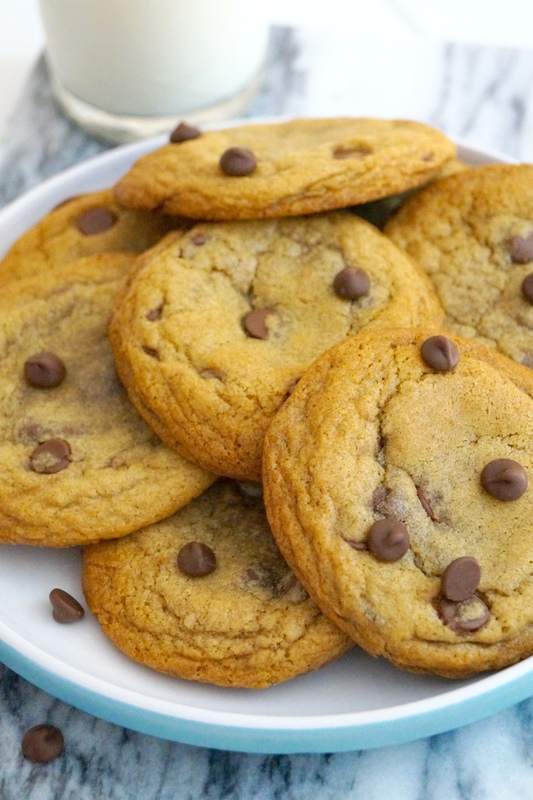 This recipe needs to be down on your baking list ASAP! 1. Line a 22cm x 15cm tin with baking parchment. Place the sugar, clotted cream and golden syrup into a large saucepan. Melt gently until all the sugar has dissolved, then bring up to the boil and allow to boil away without stirring for 3 minutes. 2. After 3 minutes, take off the heat and continuously beat the mixture for 10 minutes or until it’s thickened and is matte- this will require quite a fair bit of elbow grease and strength, but it’s really worth it! 3. Then stir in half the crumbled biscuits, then spread out into the lined tin. Finish by pressing in the remaining biscuit pieces. Cover fully and place in the fridge for at least 2 hours or overnight to set fully. Once set, slice up into smallish cubes and enjoy!